Editors: Ruth Segers, Pieter Van den Broeck, Ahmed Z.Khan, Frank Moulaert, Jan Schreurs, Bruno De Meulder, Konrad Miciukiewicz, Goeff Vigar, Ali Madanipour. Publisher APS. 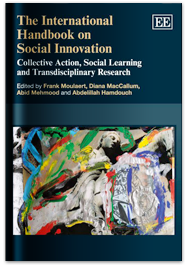 The International Handbook of Social Innovation Collective Action, Social Learning and Transdisciplinary Research presents a coherent methodologicalperspective on social innovation,which attends – both conceptuallyand practically – to the multi-scalar structural,political and cultural forces producing social exclusion but also holding thepotential for social change and sociallyinnovative initiatives. As such, it developsa line of thought, investigated and progressivelyenriched collectively by thecontributors to the volume, which connects societal wellbeing andprogress with the shape and organization of society. 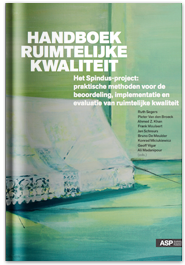 Thehandbook provides materials,analysis and insights to demonstrate thatsocial innovation is neither a ‘miracle’, a ‘chimera’, or a vain quest. It is at theheart of present and future societalconcerns and it challenges everybody: committed academics, social and political actors, activists or ordinary people. Research and action together provide documented insights on ‘how things may change’. (Editors: Frank Moulaert, Diana MacCallum, Abid Mehmood and Abdel Hamdouch. Published: 2013. Edward Elgar. ISBN 978-1-84980-998-6). 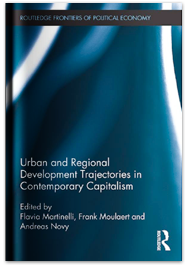 Urban and Regional Trajectories in Contemporary Capitalism revalorizes a rich scientific heritage of space- and history-sensitive development theories and turns it into an integrated methodology for the comparative analysis of urban and regional trajectories within a globalized world. The main argument put forward is that current mainstream analyses of urban and regional development fail to address the connections between different dimensions of development, the role of history and the importance of place and scale relations. The proposed methodology integrates elements from different theories – radical economic geography, regulation approach, cultural political economy, institutionalism – and recombine them into an interdisciplinary (meta)theoretical framework which focuses on key dynamics and relations, such as strategic agency and collective action, institutions and structures, culture and discourse, as well as the tension between path-dependency and path-shaping. The methodology is then applied to eight urban and regional cases, mostly from Western Europe, but also from the United States and China. The case studies confirm the relevance of time- and space-sensitive analysis, not only for understanding development trajectories, but also for policy making. They ultimately highlight that, while post-war institutions took advantage of the rich development debate and were able to address systemic contradictions fostering a relatively inclusive development model, the neoliberal turn has forfeited that theoretical tradition and has led to reductionist policies that not only have resulted in an increase in social and spatial inequalities, but have also undermined growth and democracy. (Editors: Flavia Martinelli, Frank Moulaert and Andreas Novy. Published: 2012. Routledge. ISBN: 978-0-415-60894-7). Can Neighbourhoods Save the City? Community Development and Social Innovation looks at the impact of bottom-linked, neighbourhood based, social innovation initiatives. 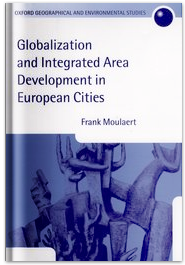 It analyses and documents a variety of innovative local urban strategies in several European cities together with their impact on wider urban socio-economic and political restructuring processes (Editors: Frank Moulaert, Erik Swyngedouw, Flavia Martinelli, and Sara Gonzalez. Published: 2010. Routledge. ISBN: 978-0415485883). 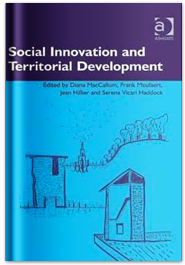 Social Innovation and Territorial Development provides a comprehensive and insightful exploration of social innovation and how it affects life, society and the economy, especially, but not exclusively, at the local and regional level. It addresses key questions about the nature of social innovation as a process and a strategy and what opportunities may exist, or may be generated, for social innovation to nourish human development. It puts forward alternative options highlighting issues of solidarity, co-operation and economic, human and cultural diversity, which are situated both outside, and in combination with, the market, within or outside cultural-artistic arenas, and at various spatial scales of social empowerment. In so-doing, this book offers a provocative response to the predominant neoliberal economic vision of spatial, economic and social change (Editors: Diana MacCallum, Frank Moulaert, Jean Hillier and Serena Vicari. Published: 2009. Ashgate Publishers. ISBN: 978-0754672333). 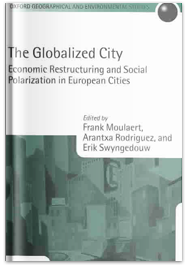 The Globalized City: Economic Restructing and Social Polarization in European Cities is a collection of discussions and case studies concerning large-scale urban development projects in nine European cities. 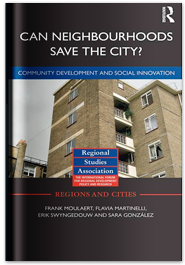 It analyzes the relation between these projects and trends such as social exclusion, the emergence of new urban elites, and the consolidation of less democratic forms of urban governance. (Editors: Frank Moulaert, Arantxa Rodriguez and Erik Swyngedouw. Published: 2005. Oxford University Press. ISBN: 978-0199260409).